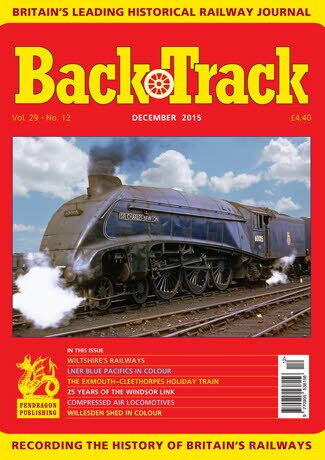 Railway Magazine | BackTrack December 2015 journal from Pendragon Publishing. 25 Years of the Windsor Link - Alan Taylor reviews a successful railway network development in the Manchester and Salford area. Wiltshire's Railways - a historical survey by Stephen Roberts. Golf and the Railways: The Links - Beverley Cole concludes her look at the connections between the two. Visiting Willesden Shed - four pages of colour by Geoff Rixon. Return to the Waverley Route - archive photos marking the partial revival of the Borders Line. R. Herbert Lapage - Darryl Grant introduces a forgotten engineer and his locomotives. A Cleaner at Hadleigh - A. J. Ludlam tells of the early career of a Suffolk engineman. Eastern Blue - three pages of historic colour showing LNER Pacifics in company and early British Railways blue livery. The Somerset & Dorset's Exmouth-Cleethorpes Holiday Train - Jonathan Edwards looks at one of the S&D's timetable oddities. Passing Bredbury Junction - two of Alan Tyson's colour shots at a busy Cheshire location. Greasy John and the Great Tay Whale - A. F. Nisbet tells the story of a Dundee showman, his prize exhibit and its railway travels. The Formative Years of the Lancaster & Carlisle Railway: Part Two - the concluding part of Jeffrey Wells's look back at the building and opening of this important part of the West Coast Main Line. Napsbury - Peter Butler notes a lost station on the Midland Main Line in Hertfordshire. It seemed like a Good Idea at the time: Part Three - Miles Macnair describes some 19th/early 20th century Compressed Air Locomotives.